Sydney confidently came in for her assessment today. She is a 25-pound, 4-month old, Golden Retriever. As soon as Sydney came into Fort Fido she was ready to investigate the building. It's almost as if Sydney knew that The Fort is a place to enjoy and interact with pups at. As soon as she entered the medium roll she began to mingle about with the other dogs. After taking some time to get to know the other pups within medium roll, Sydney began to play with Shiva. Check out the cute video below! 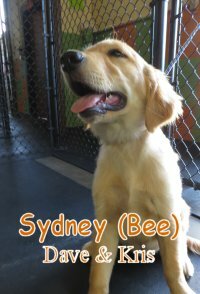 Sydney showed great socialization and playfulness, we hope to have her return soon for even more fun.